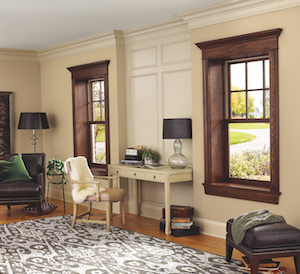 Double-hung windows by Integrity Windows can brighten any room. Here at Marshall Exteriors, we can install wood, vinyl and fiberglass double-hung windows, all with different benefits that can improve the look, comfort and value of your home. As your local window and door experts, we install a variety of replacement windows that are designed and manufactured to last. We specialize in hassle-free window replacement from start to finish. Our experts will inspect your home, go over all the options, and help you choose the type of replacement double-hung window. Call us to schedule an appointment or get a free online quote today! We proudly serve Geneva, Fairport, Newark, Canandaigua and many areas of New York.